I’m trying to find my way back into a routine, and I decided to attempt that by testing out this 2 x 3 Fabriano Artistico Extra White 300lbs soft press watercolor paper. Must the name be that long? 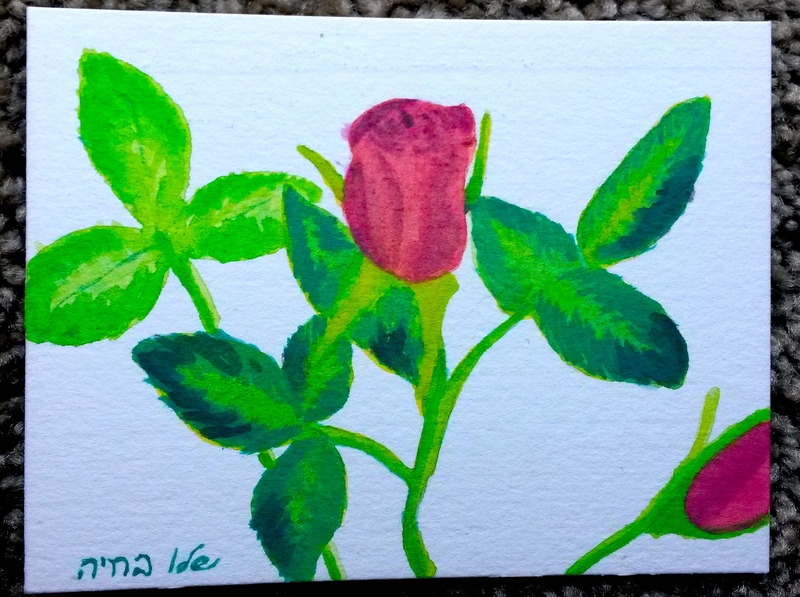 Anyway, I hadn’t quite figured it out on the rose, but the leaves got much better. Fabriano is the only brand that has a soft press and it’s supposed to be an in-between paper for cold and hot press. Once you get used to it, it’s very lovely to work with. I like that you can easily get a loose look and a tight detail all on one paper. You just have to control the amount of water on your brush and pay attention to the drying time. I’m glad that it comes in a 300lbs since I work in so many layers. I was noticing with the 140lbs paper I was working on, it just stopped taking layers at a certain point. I found this paper amongst all the sample papers that Blick sent me. I originally just asked for their hot press papers in certain brands, but I guess they just all come together, and I got the rough, cold, and hot of all of them. I’m not complaining because that’s how I found this wonderful paper. For those of you who want this piece, watch my Pinterest page this Sunday. I will be hiding it somewhere on one of my boards and the first person to comment on it will get it. I love these inktense blocks from Derwent. While they work similar to watercolor, they’re not watercolor. They’re ink in block form and depending on how much water you use, they can be opaque or more translucent. However, adding more water will affect the lightfastness of the ink. That’s pretty much my only issue with these is the lightfastness issue, but this is a new product. So I’m sure this will improve over time. I do like that you can buy sets and buy them individually. That way if you run out of a certain color, you don’t have to buy a whole new set just for that one color. You can draw with these and then add water, or add water to the block and paint just like you would with watercolor pans. I love the intensity of these colors, and as far as the lightfast issue, if you use a matte UV spray varnish and then put it behind UV glass, you should be fine. 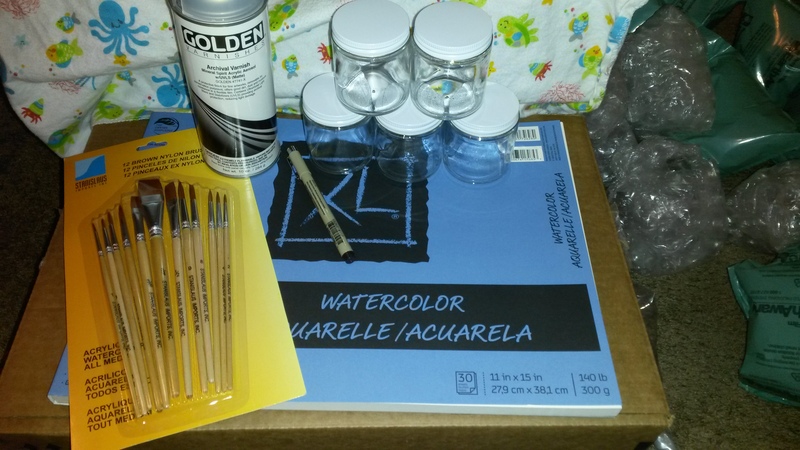 I use a UV spray by Golden for my watercolor, coffee, and tea paintings. I’ll probably just use that on these. I need to get some pencils of these inktense and do a review of how those work, but I’ll have to wait until I can afford that. In case you didn’t see my posts from the other site. Here’s the post of the review of some supplies I ordered from dickblick.com. Ok. So I finally had some time to play with my new art supplies in between taking care of my cute little one. The first thing is my FAVOURITE! I love these little glass jars. I can pour hot water into them to mix up my paint, and then put a lid on them so nothing spills when I’m not using them. I had to write on the lids to tell the difference between the coffee though. Otherwise, they get mixed up when you move them. Oops. I already knew I liked the Canson XL watercolor paper because, I was already using it. The Stanislaus brush set that I got didn’t work out. Even though it’s advertised for watercolor and acrylic, it’s too stiff for watercolor. I would consider it more of a craft acrylic brush. I’ll probably keep them for that, but I’ll need to get different brushes. These were cheap. So at least I didn’t spend a lot of money on something that didn’t work out. This is why I don’t have a painting for you guys. Even though I had time to mess around a little, the brushes ruined my painting. Sadness. The Golden Archival Spray Varnish seems to work out alright. My only suggestion is to make sure it stays outside for a while, or in a very well ventilated room. The fumes are not pleasant. I also tested the Sakura Micron pen on the painting that didn’t work out. The pen works nicely. I’ll have to redo the painting thouh. I think it’ll be easier signing with the pen than how I have been doing it. Hopefully they’ll be a new painting for you soon!